While working for a small, private elementary school Rene developed this recipe for the young vegetarians. It was a hit! The kids loved to eat their veggies when prepared in this way. Add 1 tablespoon crème fraîche, cilantro, salt and pepper. Add diced jalapeno, cumin, coriander and salt. Make sure this mixture is completely cool before adding goat cheese and cheddar cheese. While waiting for the vegetables to cool, fry the corn tortillas in an inch or two of oil. Using tongs, just a few seconds on each side. Drain raisins and add to vegetable mixture. Oil a large cookie sheet or glass baking dish. Fill each tortilla with the mixture and gently place, snugly into the dish. 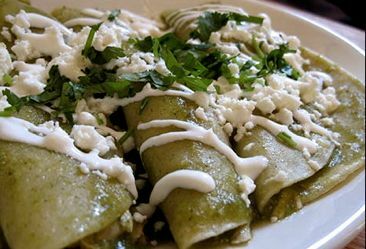 Top the dish of enchiladas with any remaining vegetable mixture and tomatillo salsa. Garnish with cilantro and crumbled crème fraîche.